Florence Cathedral, formally the Cattedrale di Santa Maria del Fiore (Italian pronunciation: [katteˈdraːle di ˈsanta maˈriːa del ˈfjoːre]; in English "Cathedral of Saint Mary of the Flower"), is the cathedral of Florence, Italy (Italian: Duomo di Firenze). It was begun in 1296 in the Gothic style to a design of Arnolfo di Cambio and was structurally completed by 1436, with the dome designed by Filippo Brunelleschi. The exterior of the basilica is faced with polychrome marble panels in various shades of green and pink, bordered by white, and has an elaborate 19th-century Gothic Revival façade by Emilio De Fabris. The cathedral is the mother church of the Roman Catholic Archdiocese of Florence, whose archbishop is Giuseppe Betori. The new church was designed by Arnolfo di Cambio and approved by city council in 1294. Di Cambio was also architect of the church of Santa Croce and the Palazzo Vecchio. He designed three wide naves ending under the octagonal dome, with the middle nave covering the area of Santa Reparata. The first stone was laid on 9 September 1296, by Cardinal Valeriana, the first papal legate ever sent to Florence. The building of this vast project was to last 140 years; Arnolfo's plan for the eastern end, although maintained in concept, was greatly expanded in size. After Arnolfo died in 1310, work on the cathedral slowed for thirty years. When the relics of Saint Zenobius were discovered in 1330 in Santa Reparata, the project gained a new impetus. In 1331, the Arte della Lana, the guild of wool merchants, took over patronage for the construction of the cathedral and in 1334 appointed Giotto to oversee the work. Assisted by Andrea Pisano, Giotto continued di Cambio's design. His major accomplishment was the building of the campanile. When Giotto died on 8 January 1337, Andrea Pisano continued the building until work was halted due to the Black Death in 1348. In 1349, work resumed on the cathedral under a series of architects, starting with Francesco Talenti, who finished the campanile and enlarged the overall project to include the apse and the side chapels. In 1359, Talenti was succeeded by Giovanni di Lapo Ghini (1360–1369) who divided the center nave in four square bays. Other architects were Alberto Arnoldi, Giovanni d'Ambrogio, Neri di Fioravante and Andrea Orcagna. By 1375, the old church Santa Reparata was pulled down. The nave was finished by 1380, and by 1418, only the dome remained incomplete. Work started on the dome in 1420 and was completed in 1436. The cathedral was consecrated by Pope Eugene IV on 25 March 1436, (the first day of the year according to the Florentine calendar). It was the first 'octagonal' dome in history to be built without a temporary wooden supporting frame. It was one of the most impressive projects of the Renaissance. During the consecration in 1436, Guillaume Dufay's motet Nuper rosarum flores was performed. The structure of this motet was strongly influenced by the structure of the dome. The dimensions of the building are enormous: building area 8,300 square metres (89,340 square feet), length 153 metres (502 feet), width 38 metres (125 feet), width at the crossing 90 metres (300 feet). The height of the arches in the aisles is 23 metres (75 feet). The height of the dome is 114.5 metres (375.7 feet). The Overseers of the Office of Works of Florence Cathedral, consisting mostly of members of the influential woolen cloth guild, the Arte della Lana, had plans to commission a series of twelve large Old Testament sculptures for the buttresses of the cathedral.Donatello, then in his early twenties, was commissioned to carve a statue of David in 1408, to top one of the buttresses of Florence Cathedral, though it was never placed there. Nanni di Banco was commissioned to carve a marble statue of Isaiah, at the same scale, in the same year. One of the statues was lifted into place in 1409, but was found to be too small to be easily visible from the ground and was taken down; both statues then languished in the workshop of the opera for several years. In 1410 Donatello made the first of the statues, a figure of Joshua in terracotta. In 1409-1411 Donatello made a statute of Saint John the Evangelist which until 1588 was in a niche of the old cathedral façade. A figure of Hercules, also in terracotta, was commissioned from the Florentine sculptor Agostino di Duccio in 1463 and was made perhaps under Donatello's direction. A statute of David by Michelangelo was completed 1501-1504 although it could not be placed on the Butteresss because of its six ton weight. In 2010 a fiberglass replica of "David" was placed for one day on the Florence cathedral. Donatello first version of David (1408–1409). Museo Nazionale del Bargello, Florence. Height 191 cm. A Fiberglass replica of Michaelangelo's David statue [seen from the north]. This was the original placement planned for the statue. By the beginning of the 15th century, after a hundred years of construction, the structure was still missing its dome. The basic features of the dome had been designed by Arnolfo di Cambio in 1296. His brick model, 4.6 metres (15.1 feet) high, 9.2 metres (30.2 feet) long, was standing in a side aisle of the unfinished building, and had long been sacrosanct. It called for an octagonal dome higher and wider than any that had ever been built, with no external buttresses to keep it from spreading and falling under its own weight. The commitment to reject traditional Gothic buttresses had been made when Neri di Fioravanti's model was chosen over a competing one by Giovanni di Lapo Ghini. That architectural choice, in 1367, was one of the first events of the Italian Renaissance, marking a break with the Medieval Gothic style and a return to the classic Mediterranean dome. Italian architects regarded Gothic flying buttresses as ugly makeshifts. Furthermore, the use of buttresses was forbidden in Florence, as the style was favored by central Italy's traditional enemies to the north. Neri's model depicted a massive inner dome, open at the top to admit light, like Rome's Pantheon, but enclosed in a thinner outer shell, partly supported by the inner dome, to keep out the weather. It was to stand on an unbuttressed octagonal drum. Neri's dome would need an internal defense against spreading (hoop stress), but none had yet been designed. The building of such a masonry dome posed many technical problems. Brunelleschi looked to the great dome of the Pantheon in Rome for solutions. The dome of the Pantheon is a single shell of concrete, the formula for which had long since been forgotten. The Pantheon had employed structural centring to support the concrete dome while it cured . This could not be the solution in the case of a dome this size and would put the church out of use. For the height and breadth of the dome designed by Neri, starting 52 metres (171 ft) above the floor and spanning 44 metres (144 ft), there was not enough timber in Tuscany to build the scaffolding and forms. Brunelleschi chose to follow such design and employed a double shell, made of sandstone and marble. Brunelleschi would have to build the dome out of brick, due to its light weight compared to stone and being easier to form, and with nothing under it during construction. To illustrate his proposed structural plan, he constructed a wooden and brick model with the help of Donatello and Nanni di Banco, a model which is still displayed in the Museo dell'Opera del Duomo. The model served as a guide for the craftsmen, but was intentionally incomplete, so as to ensure Brunelleschi's control over the construction. Brunelleschi's solutions were ingenious, such as his use of the catenary arch for support. The spreading problem was solved by a set of four internal horizontal stone and iron chains, serving as barrel hoops, embedded within the inner dome: one at the top, one at the bottom, with the remaining two evenly spaced between them. A fifth chain, made of wood, was placed between the first and second of the stone chains. Since the dome was octagonal rather than round, a simple chain, squeezing the dome like a barrel hoop, would have put all its pressure on the eight corners of the dome. The chains needed to be rigid octagons, stiff enough to hold their shape, so as not to deform the dome as they held it together. Each of Brunelleschi's stone chains was built like an octagonal railroad track with parallel rails and cross ties, all made of sandstone beams 43 centimetres (17 in) in diameter and no more than 2.3 metres (7.5 ft) long. The rails were connected end-to-end with lead-glazed iron splices. The cross ties and rails were notched together and then covered with the bricks and mortar of the inner dome. The cross ties of the bottom chain can be seen protruding from the drum at the base of the dome. The others are hidden. Each stone chain was supposed to be reinforced with a standard iron chain made of interlocking links, but a magnetic survey conducted in the 1970s failed to detect any evidence of iron chains, which if they exist are deeply embedded in the thick masonry walls. Brunelleschi also included vertical "ribs" set on the corners of the octagon, curving towards the center point. The ribs, 4 metres (13 ft) deep, are supported by 16 concealed ribs radiating from center. The ribs had slits to take beams that supported platforms, thus allowing the work to progress upward without the need for scaffolding. A circular masonry dome can be built without supports, called centering, because each course of bricks is a horizontal arch that resists compression. In Florence, the octagonal inner dome was thick enough for an imaginary circle to be embedded in it at each level, a feature that would hold the dome up eventually, but could not hold the bricks in place while the mortar was still wet. Brunelleschi used a herringbone brick pattern to transfer the weight of the freshly laid bricks to the nearest vertical ribs of the non-circular dome. The outer dome was not thick enough to contain embedded horizontal circles, being only 60 centimetres (2 ft) thick at the base and 30 centimetres (1 ft) thick at the top. To create such circles, Brunelleschi thickened the outer dome at the inside of its corners at nine different elevations, creating nine masonry rings, which can be observed today from the space between the two domes. To counteract hoop stress, the outer dome relies entirely on its attachment to the inner dome and has no embedded chains. 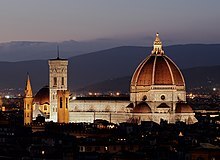 Brunelleschi's ability to crown the dome with a lantern was questioned and he had to undergo another competition, even though there had been evidence that Brunelleschi had been working on a design for a lantern for the upper part of the dome. The evidence is shown in the curvature, which was made steeper than the original model. He was declared the winner over his competitors Lorenzo Ghiberti and Antonio Ciaccheri. His design (now on display in the Museum Opera del Duomo) was for an octagonal lantern with eight radiating buttresses and eight high arched windows. Construction of the lantern was begun a few months before his death in 1446. Then, for 15 years, little progress was possible, due to alterations by several architects. The lantern was finally completed by Brunelleschi's friend Michelozzo in 1461. The conical roof was crowned with a gilt copper ball and cross, containing holy relics, by Verrocchio in 1469. This brings the total height of the dome and lantern to 114.5 metres (376 ft). This copper ball was struck by lightning on 17 July 1600 and fell down. It was replaced by an even larger one two years later. In 2010 a Fiberglass replica of Michaelangelo's David statue was placed for one day on the Florence cathedral [seen from the north]. This was the original placement planned for the statue. The original façade, designed by Arnolfo di Cambio and usually attributed to Giotto, was actually begun twenty years after Giotto's death. A mid-15th-century pen-and-ink drawing of this so-called Giotto's façade is visible in the Codex Rustici, and in the drawing of Bernardino Poccetti in 1587, both on display in the Museum of the Opera del Duomo. This façade was the collective work of several artists, among them Andrea Orcagna and Taddeo Gaddi. This original façade was completed in only its lower portion and then left unfinished. It was dismantled in 1587–1588 by the Medici court architect Bernardo Buontalenti, ordered by Grand Duke Francesco I de' Medici, as it appeared totally outmoded in Renaissance times. Some of the original sculptures are on display in the Museum Opera del Duomo, behind the cathedral. Others are now in the Berlin Museum and in the Louvre. The competition for a new façade turned into a huge corruption scandal. The wooden model for the façade of Buontalenti is on display in the Museum Opera del Duomo. A few new designs had been proposed in later years, but the models (of Giovanni Antonio Dosio, Giovanni de' Medici with Alessandro Pieroni and Giambologna) were not accepted. The façade was then left bare until the 19th century. The three huge bronze doors date from 1899 to 1903. They are adorned with scenes from the life of the Madonna. The mosaics in the lunettes above the doors were designed by Niccolò Barabino. They represent (from left to right): Charity among the founders of Florentine philanthropic institutions; Christ enthroned with Mary and John the Baptist; and Florentine artisans, merchants and humanists. The pediment above the central portal contains a half-relief by Tito Sarrocchi of Mary enthroned holding a flowered scepter. Giuseppe Cassioli sculpted the right-hand door. Vasari's fresco begun in 1568, and completed by Federico Zuccari in 1579. It was suggested that the interior of the 45 metre (147 ft) wide dome should be covered with a mosaic decoration to make the most of the available light coming through the circular windows of the drum and through the lantern. Brunelleschi had proposed the vault to glimmer with resplendent gold, but his death in 1446 put an end to this project, and the walls of the dome were whitewashed. Grand Duke Cosimo I de' Medici decided to have the dome painted with a representation of The Last Judgment. This enormous work, 3,600 metres² (38 750 ft²) of painted surface, was started in 1568 by Giorgio Vasari and Federico Zuccari and would last till 1579. The upper portion, near the lantern, representing The 24 Elders of Apoc. 4 was finished by Vasari before his death in 1574. Federico Zuccari and a number of collaborators, such as Domenico Cresti, finished the other portions: (from top to bottom) Choirs of Angels; Christ, Mary and Saints; Virtues, Gifts of the Holy Spirit and Beatitudes; and at the bottom of the cupola: Capital Sins and Hell. These frescoes are considered Zuccari's greatest work. But the quality of the work is uneven because of the input of different artists and the different techniques. Vasari had used true fresco, while Zuccari had painted in secco. During the restoration work, which ended in 1995, the entire pictorial cycle of The Last Judgment was photographed with specially designed equipment and all the information collected in a catalogue. All the restoration information along with reconstructed images of the frescos were stored and managed in the Thesaurus Florentinus computer system. ^ Ermengem, Kristiaan Van. "Duomo di Firenze, Florence". A View On Cities. Retrieved 5 February 2016. ^ Bartlett, pp. 36–37; according to Bartlett, the people of Florence continued to call the cathedral by its former name for some time after reconstruction. ^ Tarihi, Güncelleme (23 May 2018). "Michelangelo Rönesans döneminde Floransanın önde gelen Medici Ailesinin özel bir isteği üzerine hangisini yapmıştır". Haber46 (in Turkish). Retrieved 5 July 2018. ^ Haines, Margaret (1989). "Brunelleschi and Bureaucracy: The Tradition of Public Patronage at the Florentine Cathedral". I Tatti Studies in the Italian Renaissance. 3: 89–115. doi:10.2307/4603662. JSTOR 4603662. ^ Krén, Emil; Marx, Daniel. "View of the nave and choir by ARNOLFO DI CAMBIO". Web Gallery of Art. Retrieved 5 July 2018. ^ Sannio, Simone (12 January 2017). "Inside the House of Medici (Part II): Palazzo Vecchio". L'Italo-Americano. Retrieved 5 July 2017. ^ "Santa Maria Del Fiore Church (Dome) Firenze Italy". En.firenze-online.com. Retrieved 26 March 2013. ^ Charles Seymour, Jr. "Homo Magnus et Albus: the Quattrocento Background for Michelangelo's David of 1501–04," Stil und Überlieferung in der Kunst des Abendlandes, Berlin, 1967, II, 96–105. ^ a b "Brunelleschi's Dome". Smarthistory at Khan Academy. Retrieved 19 December 2012. ^ Stevenson, Niel (2007) Architecture Explained. ISBN 0756628687. pp. 36–37. ^ Mueller, Tom (10 February 2014). "Mystery of Florence's Cathedral Dome May Be Solved". National Geographic Society. Retrieved 31 December 2014. ^ Gartner, Peter, Filippo Brunelleschi 1377–1446, p 95. King, Ross (2000). Brunelleschi's Dome: How a Renaissance Genius Reinvented Architecture. London: Chatto & Windus. ISBN 9781620401941. Jepson, Tim (2001). The National Geographic Traveler, Florence & Tuscany. National Geographic Society. ISBN 978-90-215-9720-1. Suro, Roberto (28 July 1987). "Cracks in a Great Dome in Florence May Point to Impending Disaster". New York Times. p. C3. Retrieved 26 February 2010. Wirtz, Rolf C. (2005). Kunst & Architektur, Florenz. Könemann. ISBN 3-8331-1576-9. Gärtner, Peter J. (1998). Filippo Brunelleschi 1377-1446. Köln : Könemann. ISBN 978-3-8290-0241-7. "The Cathedral". The Florence Art Guide. 2004. Retrieved 14 July 2006. Horner, Susan; Horner, Joanna (27 December 2005). "Chapter III: The Cathedral – Exterior". Walks in Florence. Retrieved 14 July 2006.